HOUSTON - Police are investigating what caused a pickup driver to veer off and head into oncoming traffic, striking an SUV and killing one passenger in Montgomery Sunday. The deadly crash was reported around noon in the 21000 block of Eve Street. Police said when they responded to the major crash, they found an SUV with three people trapped inside, one of which died at the scene. The driver of the Dodge pickup truck was found injured inside and taken to a hospital. Investigators said they came across several pills in the pickup. 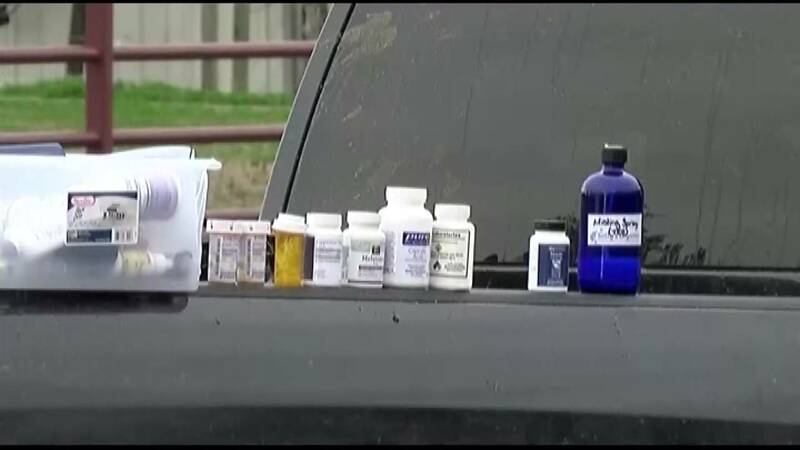 Investigators recover bottles of pills inside a pickup truck after a deadly crash on Feb. 10, 2019 in Montgomery. The two other passengers in the SUV were taken to a hospital as well for their injuries. Investigators said the crash was a result of a wrong-way driver. "Preliminary investigation reveals the SUV was traveling eastbound while the Dodge pickup was heading westbound and crossed over the center lane and struck the vehicle," Sgt. James Bracht said.